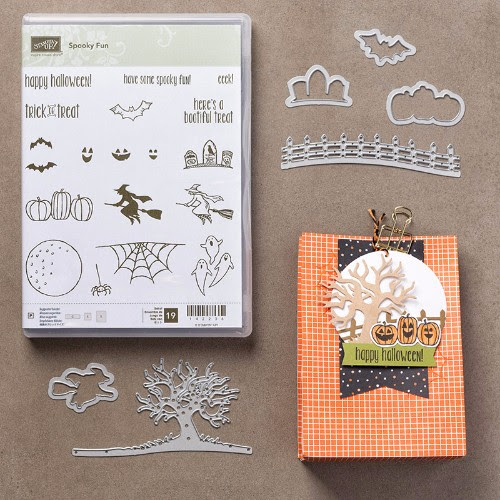 Stamp set found in the NEW 2016 Holiday catalog, page 52. Basic Gray: 5 1/2" x 8 1/2" and 5” x 3 3/4"
Score the Basic Gray card base at 4 1/4" and fold. Use Memento Tuxedo Black ink to stamp two sets of tombstones on Smoky Slate cardstock and one moon on Crushed Curry cardstock. 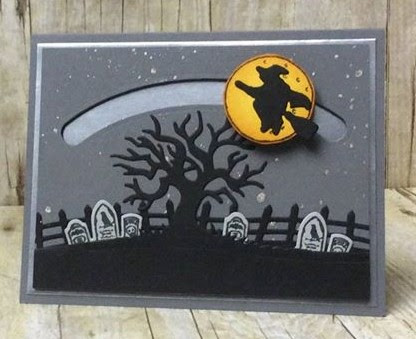 Use the Halloween Scenes Edgelits to die cut the Smoky Slate tombstones, the spooky tree from the largest Basic Black piece, the fence from the middle sized piece and the witch from the smallest. Use Paper Snips to trim the moon and then pick up Pumpkin Pie ink with a Stamping Sponge and sponge around the edges of the moon. Use the Clear Wink of Stella and splatter the Basic Gray mat to create a star effect. Allow to fully dry Then use a die from the Sliding Star Framelits to die cut the trail across the sky about 1/2” from the top. Use SNAIL adhesive to attach the tombstones behind the ground. Cut the fence section and glue behind the tree and tombstones and then glue everything to the Basic Gray mat. Use SNAIL to attach the Silver Foil mat onto the card base and then use Stampin’ Dimensionals to attach the art piece to the Silver Foil. 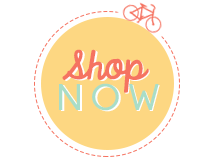 Use a Stampin’ Dimensional and attach 2 pennies or 2 washers together. Carefully insert the penny/washer into the slot (1 penny/washer on top of slot and 1 penny/washer under the slot. 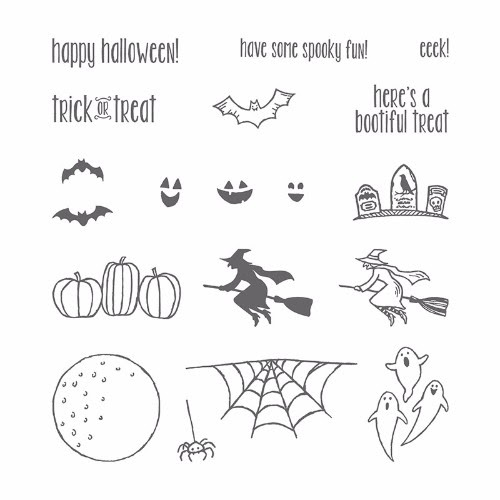 Glue the witch onto the moon and then use a Stampin’ Dimensional to attach the moon to the penny/washer. Now watch her fly and twirl across the night sky.